Jehlum River or Jhelum River (Punjabi: ਜੇਹਲਮ, Punjabi: دریاۓ جہلم) is the largest and most western of the five rivers of Punjab, and passes through Jhelum District. It is a tributary of the Indus River and has a total length of about 480 miles (774 kilometers). The river Jhelum rises from a spring at Verinag situated at the foot of the Pir Panjal in the south-eastern part of the valley of Kashmir. It flows through Srinagar and the Wular Lake before entering Pakistan from Kashmir through a deep narrow gorge. 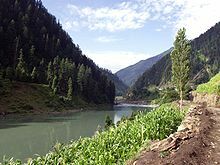 The Kishenganga Neelum River, the largest tributary of the Jhelum, joins it near Muzaffarabad, as does the next largest, the Kunhar River of the Kaghan valley. It also connects with Pakistan and Pakistan-administered Kashmir on Kohala Bridge east of Circle Bakote. It is then joined by the Poonch river, and flows into the Mangla reservoir in the Mirpur District. The Jhelum enters the Punjab in the Jhelum District. From there, it flows through the plains of Pakistan's Punjab, forming the boundary between the Chaj and Sindh Sagar Doabs. It ends in a confluence with the Chenab at Trimmu in District Jhang. The Chenab merges with the Sutlej to form the Panjnad River which joins the Indus River at Mithankot. This page was last changed on 7 January 2017, at 04:11.